1. Preheat oven to 325º F. Place the hazelnuts in a single layer on a cookie sheet. Roast the hazelnuts for 10-15 minutes, watching very closely, you don’t want them to burn. Once they are ready, the skins will have darkened a bit and many will have come loose. 2. Add the nuts to the middle of a damp kitchen towel. Close the towel up and rub the nuts vigorously to loosen their skins. Take the nuts without their skins out of the towel and place into the bowl of the processor. Continue rubbing until you get the skins off the rest of the nuts. 3. Add all of the nuts to your food processor. 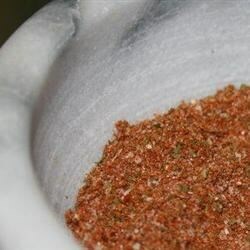 Grind to a fine powder (2-10 minutes, or so), At this time, add the coconut oil. Continue processing until it becomes smooth and creamy, stopping to scrape down the sides of the bowl every minute or two. This may take 12-15 minutes (possibly longer) depending on the strength of your food processor. 4. At around 15-20 minutes once the hazelnut butter is ready, now you can add in the remaining ingredients slowly and keep processing and scraping down the bowl for another 5-10 minutes, or until silky smooth. Enjoy a big spoonful while it is warm. In the bowl of a stand mixer fitted with a dough hook, stir together water, oil, molasses, and honey until mixed well. Add wheat flour to water mixture. Add cocoa, yeast, and salt, and stir until blended. Allow mixture sit for 10 minutes. Stir in bread flour, one cup at a time, until dough clings to hook and almost clears the sides of mixer, about 3-4 minutes. Cover bowl with greased plastic wrap. Allow dough to rise in the bowl until doubled, about 30-60 minutes. Divide into 2 pieces for large loaves or 6 pieces for mini loaves. Cover each piece with greased plastic wrap, and let dough rest for 5 minutes. Shape pieces into loaves, and sprinkle with oats or corn meal. Place each loaf in a greased loaf pans. Let dough rise until doubled, about 30-60 minutes. Toward the end of the rising time, preheat oven to 350 F.
Bake at for 30-40 minutes. 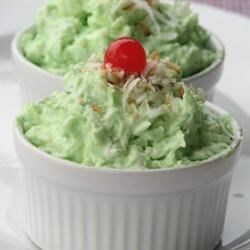 This is one of my Mother’s Weight Watcher Recipes that she used to make when she was following the diet with exchanges. This version doesn’t use cool whip, marshmallows or nuts. If you would rather use those ingredients, just substitute the yogurt for the cool whip, add 1/2 cup small marshmallows and 1/2 cup chopped walnuts to the recipe. Pour all of the ingredients into a bowl and use a spoon to toss and mix until incorporated. Cover with wrap and chill. 8 Servings. Diabetic Exchanges: 1 fruit, 1/4 milk, optional calories 10. Beat the eggs until they are frothy. In a large bowl, mix together the eggs, milk, flour, sugar, vanilla, salt and cinnamon. Place about a tablespoon of butter on a large skillet or griddle and heat to medium high on your stovetop. When the butter has melted (do not let it burn) start dipping your bread. Place a slice of bread into the batter and let soak for about 30 seconds, Turn it over and do the same for the other side. Carefully pick up the bread and let the excess batter drip off into the bowl. Place the battered bread onto the hot skillet or griddle. Cook toast for about 1 1/2-2 minutes or until the side is golden brown. Flip the bread and do the same for the other side. Remove from the pan to a plate. Dust with powdered sugar. Serve with more butter, whipped cream and real maple syrup. 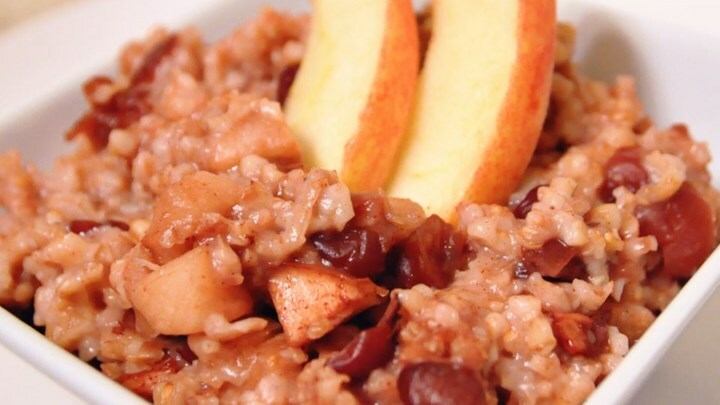 Place the Steel Cut Oats, water, apple, raisins, butter, cinnamon, brown sugar, and vanilla extract into a slow cooker with a liner. Stir to combine and dissolve the brown sugar. Cover the slow cooker, set to low, and allow the oats to cook 7 hours (for firm oats) or 8 hours (for softer texture). 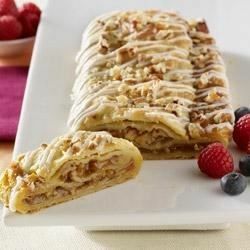 For kringle, preheat oven to 350 degrees F. Place all pecans on a sheet pan and toast for 8 minutes. Cool, chop and set aside. Increase oven temperature to 400 degrees F. Line a baking pan with parchment paper. Unfold puff pastry in center of prepared pan. Evenly spread half of Marzetti Old Fashioned Caramel Dip onto center section of dough. Sprinkle with1/3 cup pecans. Fold one-third section of dough over to cover caramel and pecans. Spread that dough layer with remaining Marzetti Old Fashioned Caramel Dip and 1/3 cup pecans. Fold remaining section of dough over all, trying to completely cover caramel and pecans. Bake 15 to 20 minutes or until pastry is golden brown. 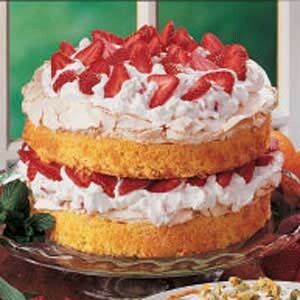 For icing, whisk together all ingredients, adding additional milk if necessary.